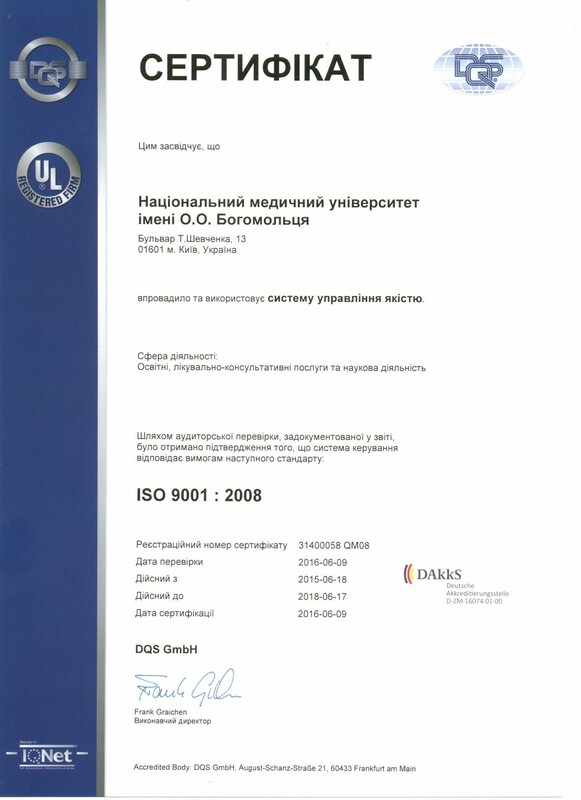 On 18, June, 2015 the university for the first time received the certificate for conformity of quality management system to requirements of international standards ISO 9001:2008. The work of the collective was directed to certification namely of educational services as the main ones in the work of University. The policy of O.O. 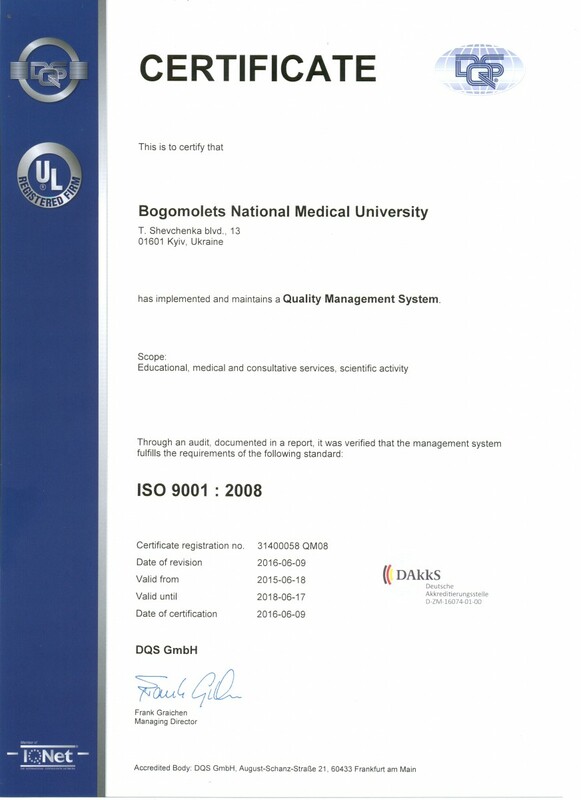 Bohomolets National medical university is directed to achieve its strategic goal – to consolidate the positions of the best higher school of medical direction in Ukraine, as well as to provide with the worthy position in European and world ratings of higher schools due to quality in rendering the educational services. Today we have one more victory – Certifying authority DQS GmbH took the positive decision about confirmation for effect of certificate with enlargement of sphere of certification to medical consulting services and scientific activity. 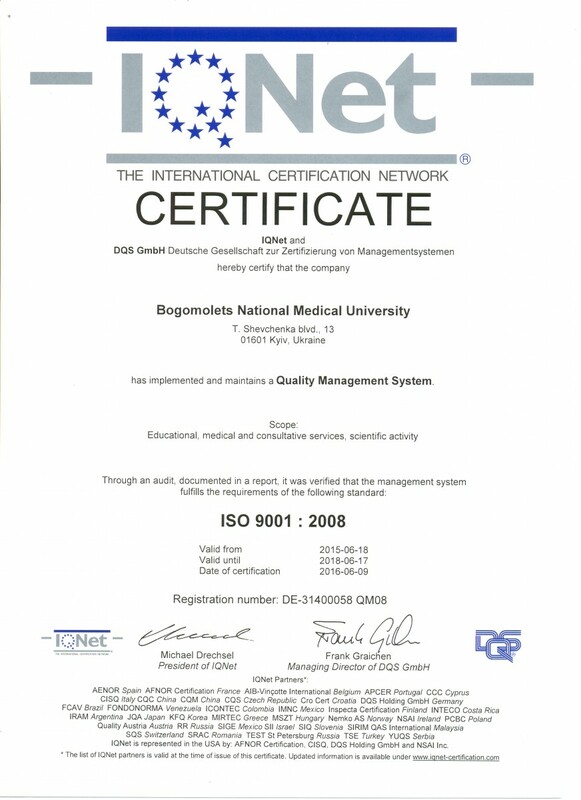 On 18-20, May, 2016 after performed supervisory audit the University received the new certificates of conformity to requirements of international standards ISO 9001:2008. This symbolic landmark is the official acknowledgment that O.O. Bohomolets NMU has been working pursuant to international standards. Our university is unique; the collective performs the extraordinary important mission – to train the competent specialists for medical sphere of health care according to existing legislation, requirements of employers, regulatory authorities, society. We congratulate the collective of university and wish the new achievements!